HÀ NỘI — Conservationists and scientists have strongly called on the Government to stop allowing organisations and individuals commercially farming and trading endangered species in Việt Nam. The call was made after conservationists and scientists recently discovered commercial farming and trading of endangered species barely contributed to the reduction of species smuggling which was the Government’s major aim when it gave the green light to commercial farming and trading of endangered species. Bùi Thị Hà, deputy head of the Education for Nature – Việt Nam (ENV), said a two-year survey, released last Wednesday, taken by the organisation of the 26 biggest commercial farms of endangered species throughout the country, showed that all farms had signs of illegally buying wild endangered species and selling them as captive endangered species. Under current regulations, owners of the farms must show a one-use licence, issued by the local forest management division, when undertaking trading activity of their captive endangered species, Hà said. However, the owners often illegally used one licence for many transactions. For examples, they only had a license to sell a couple of captive civets, however, after they sold the captive civets, they illegally bought wild civets and continued to use the same licence to sell them, she said. Therefore, it was considered as a trick to legalise their wildlife smuggling, she said. 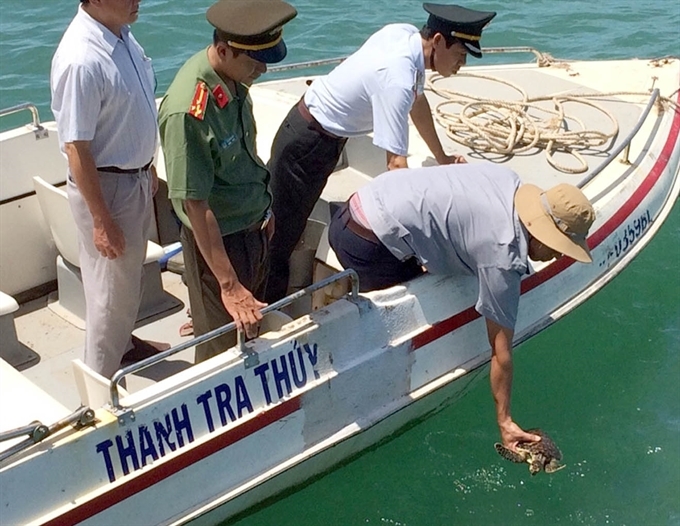 Journalist Ðỗ Doãn Hoàng, a member of the survey team, said when the survey was conducted, most of the commercial farms were raising several individuals of endangered species such as snakes or turtles. But they could provide up to thousands of snakes or turtles within several days for anyone who demanded it. It was the most eyebrow-raising thing, he said. “So the big question is where do they take the animals from?” he said. Khổng Trung, head of the central Quảng Trị Province’s Forest Management Division, said giving permission to commercial farming and trading in endangered species actually caused troubles for forest rangers when enforcing laws. It was hard for forest rangers to distinguish between products of wild animal species and captive animal species, he said. For examples, it was impossible to differentiate between tiger-bone glue made from wild tiger and tiger-bone glue made from captive tiger, he said. “The only way to protect endangered species is to ban trading activities in all forms,” he said. Associate professor Lê Xuân Cảnh, former head of the Việt Nam Academy of Science and Technology, said several endangered species, including pangolin and water monitor (Varanus salvator), were unable to reproduce in captivity. So, owners of commercial farms breeding pangolins or water monitors often illegally buy wild pangolins or water monitors to meet the demand of the market, he said. It could push endangered species to extinction, causing a decline in biodiversity, he said.